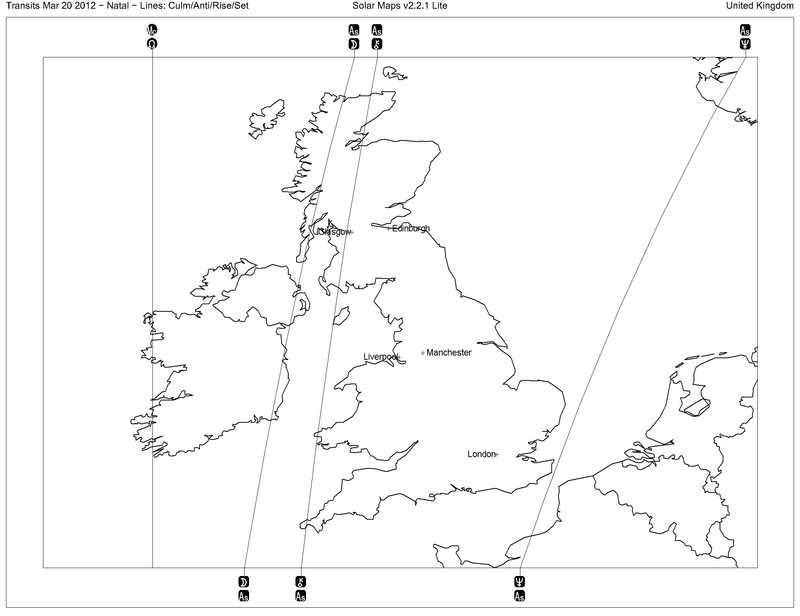 The Vernal Equinox occurs March 19th in most of the United States and March 20th in UK / Europe. (Click here for more about the change of seasons in 2016.) We have a Focused Yod present. (For more about Focused Yods in 2016, click here.) That pattern requires you to make a decision (choose wisely!) but also gives you the power to “get things done” once you have made that decision. That pattern occurring at this time will give you both a similar requirement and a similar advantage until at least the Summer Solstice and possibly as long as the Vernal Equinox in 2017. Other patterns are also present, including a Hele and a Square Key. For more about Hele patterns in 2016, click here. For more about Square Keys in 2016, click here. The ongoing Square Key also tells us that you will be learning important “lessons” at this time. Saturn, Uranus, Pluto, and the North Node are involved, so the “lessons” could be a bit harsh at times. If you survive them, you will have new ideas, be fundamentally transformed in some way, and be aware of what is essential. 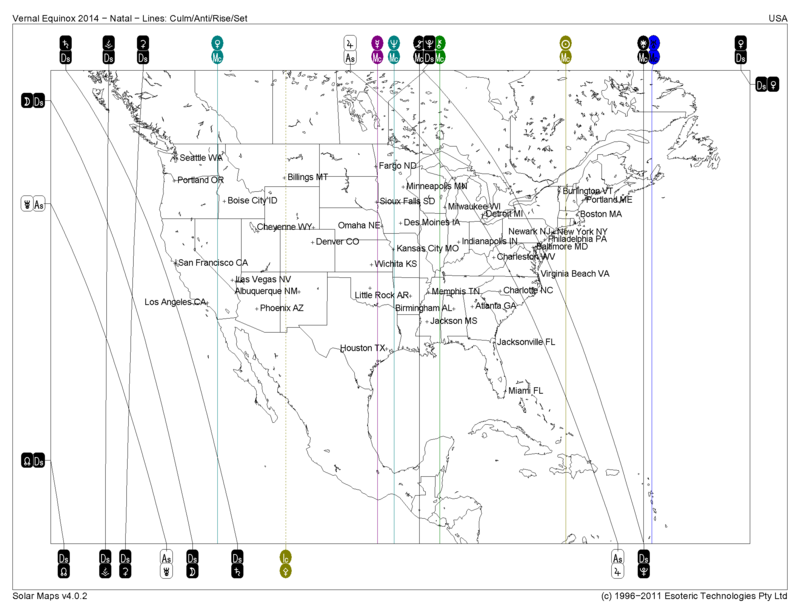 Here are the key pages for the Solar Eclipse of March 20, 2015 and the Vernal Equinox of 2015 (on the same date, but separate events 12 hours apart). Looking for earlier posts, such as the recent exact square of Uranus to Pluto? Click here. 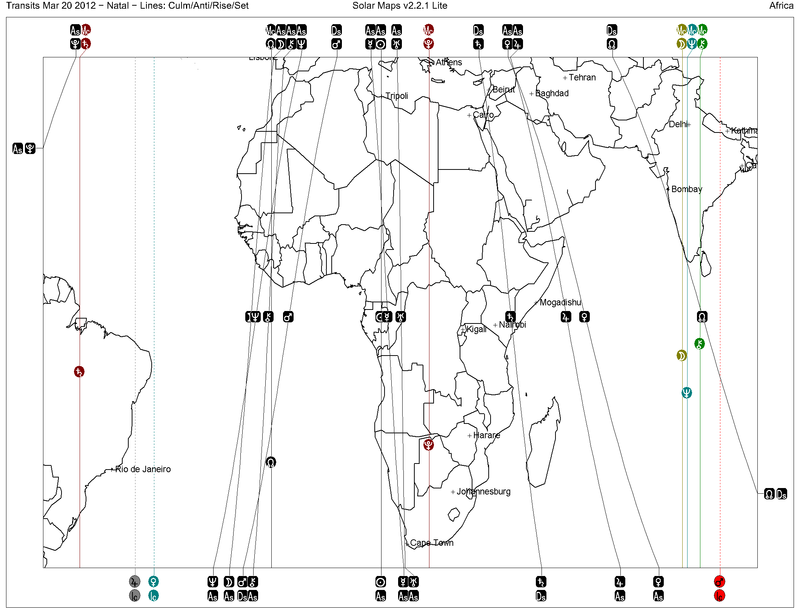 Here are maps for Africa, South America, SE Asia, and Other Maps. You may find this navigation page to be helpful. The Vernal Equinox of 2012 is at hand. 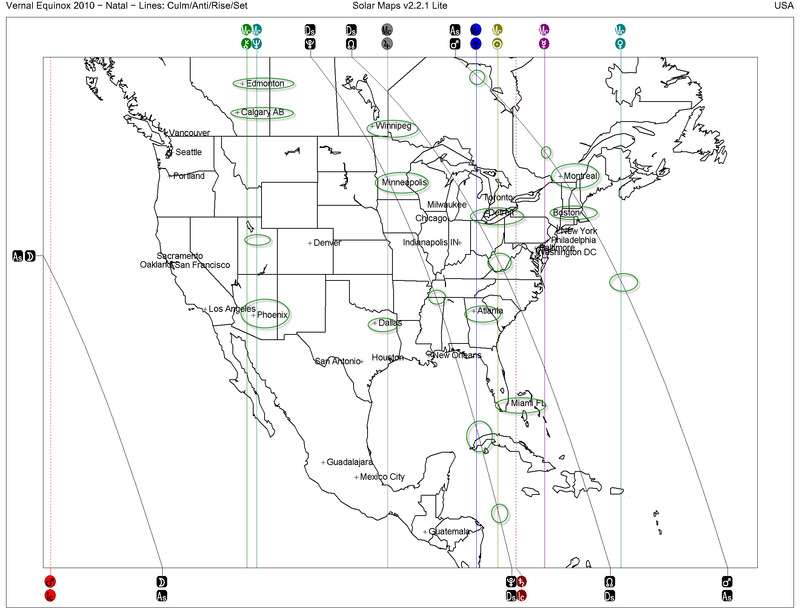 Here is the basic chart, set in Plano. If you are planning a celebration, and you are in the Western Hemisphere, hold it on the evening of the 19th (or perhaps the 18th). However, avoid significant actions to launch new projects until the New Moon of the 22nd. The weekend following the 22nd will herald the true beginning of Spring for many. From that list, we note that August of 2012 has a Blue Moon on August 31st. Using this source: http://www.seasky.org/astronomy/astronomy-calendar-2012.html We note that the already spectacular Full Moon of May 6th will be accompanied by a meteor shower to the east, in the constellation of Aquarius. Perhaps this is another good time for a celebration. From that same source, we observe that the Summer’s Solstice this year will immediately FOLLOW a New Moon. This will be another interesting time. 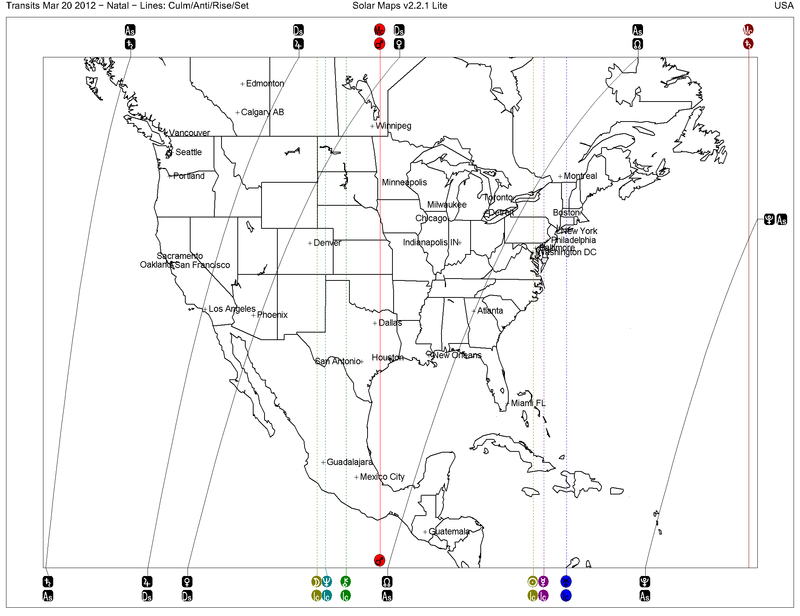 With Mars at Midheaven in Southern Mexico, here in Plano, and north through Chicago, we can expect an “interesting” Spring along that line. Great for athletics but also associated with acts of violence. The Western U.S., and especially Northwestern Mexico, received a benevolent gift of some kind via the Venus & Jupiter (in Taurus) lines. The East Coast is highly activated, and Uranus is touching Boston. We expect really smart people there (Cambridge?) doing really smart things, possibly accidents, and a very good chance of both. A combination of the Node (fate) and several other lines occurs west of Montreal, and we expect Canadians to see some powerful event or culmination of a problem in that region this Spring. Finally, all of Appalachia this spring will be touched by the Node line, which passes directly through Atlanta and through the “panhandle” of Western Florida (aka “The Emerald Coast”). The problems of the poor and disenfranchised in this region can no longer be ignored, and we may see some kind of followup to the mining explosion of 2010 (mentioned elsewhere on this blog) that was eclipsed by the BP Oil spill. Both of those accidents highlight not only abuses, but an abusive way of thinking, among those who occupy positions of power in corporate America. With Uranus square Pluto for the next few YEARS, expected reversals of fortune that force better behavior on behalf of the poor and disenfranchised in this region. 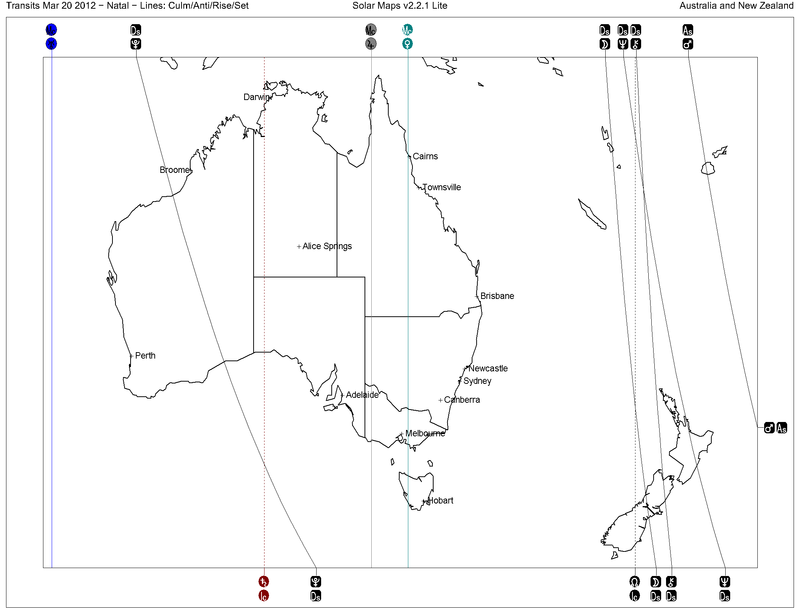 Mostly good news for Australia: Melbourne is HIGHLY favored at this time by a Venus at Midheaven. This is a good place to be at this time; overall, favorable things are happening & will be happening. On a less pleasant note, Darwin has a Saturn line passing nearby, and this bodes for a period of austerity. The exact nature is unclear, but this could be further economic contraction. Whatever remains after this period will be a very strong Darwin focused on the most important principles. At first blush, Perth does not have any activity. However, it is roughly at the midpoint between the Pluto and Uranus lines. Recall, if you will, that this aspect has been described as the “reversal of fortunes” aspect. Some wealthy will lose their money, and some poor will have newfound fortune. Finally, New Zealand is so highly activated that I am not sure what to say. Something tells me that something involving outsiders, not from NZ, is cooking and that it will be very big. 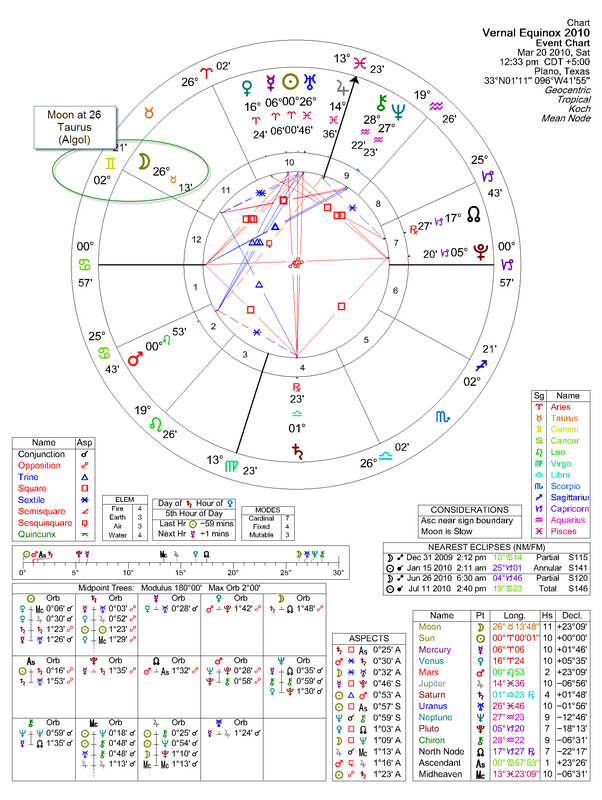 Node, Moon, Neptune, and Chiron all pass through NZ, and they are currently associated with things Piscean. Issues involving certain arts (music and poetry) and religion could be very big there. An island to the Northeast has a Mars line passing through it, and it may experience some of the same issues of potential violence (or great athletic performance) as other areas with Mars lines. Refer to map, below. That is it for now. Hope the Venus/Jupiter conjunction of March 14th fares /fared you well. Update: The VE is almost here, so I am adding a few last minute maps. First: Asia. 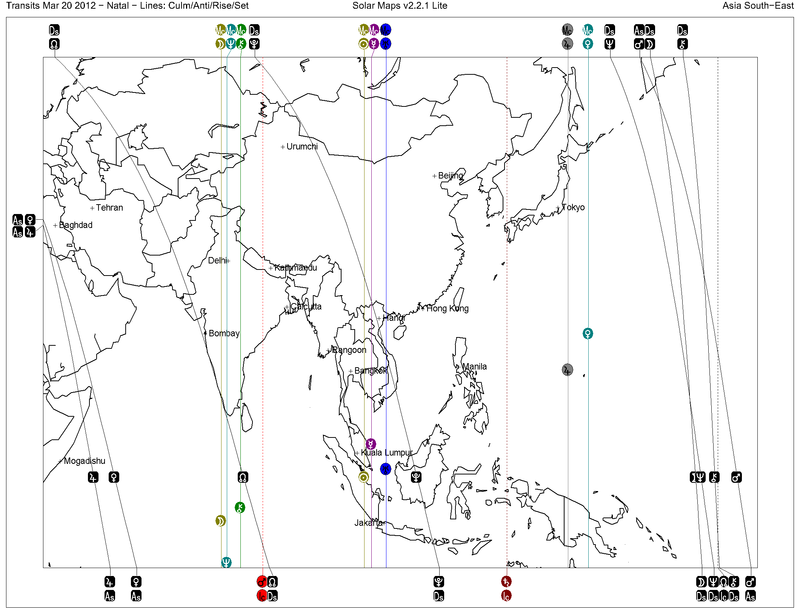 Note the Sun MC chart line going near Hanoi, Bangkokh, Kuala Lumpur, and Jakarta. The impact of this particular VE will be particularly powerful for these cities and the region between them (all are on one side or the other of the Sun MC). The North Node (Karmic) Line is all along the Western Coast of India, indicating some kind of working off of Karma there. The line is almost on top of Bombay. A Pluto line also comes near Hanoi, indicating some kind of challenge there. 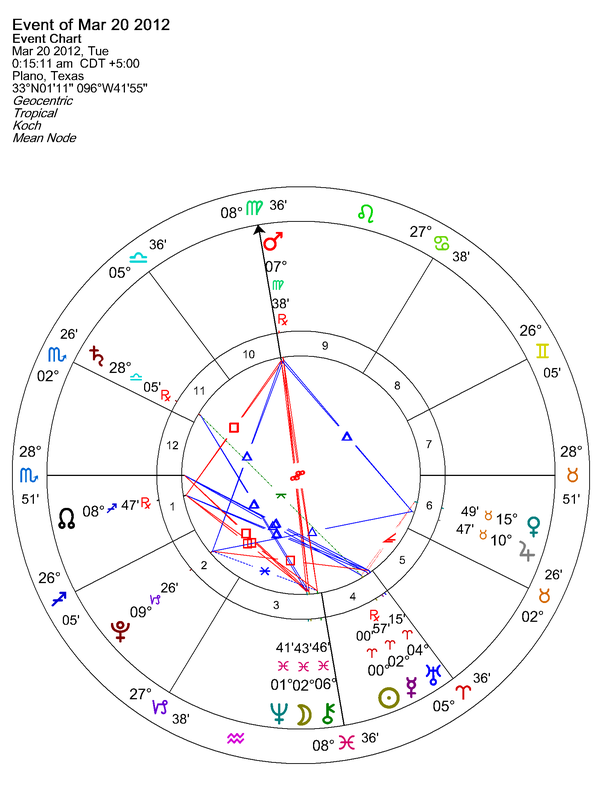 Based on Pluto’s position in Capricorn, and what it did upon its entry into Capricorn in 2008 (financial crash), I bet Hanoi may especially feel any kind of financial problems that may be currently occurring. Here is the map. Sometimes I just use the Europe map to cover the UK as well, but this time I thought a separate map was appropos. Note the Neptune Ascendant line through the Channel. Not sure what this means, but Neptune has a way of sweeping things away. My guess is that, if they are not showing already, something like signs of dangerous erosion to the infrastructure related to Channel traffice will come to light or SHOULD come to light. This might even have a more metaphorical meaning, as England and France are forced to somehow re-define their very long term and very old relationship. Look to what was happening 240 years ago, roughly (the U.S. Revolution? ), and you might find the answer. Chiron’s line touches Glasgow, and this means that Scotland is working on some kind of healing. My guess is that it is financial but it may be more literal. Could be an outbreak of some kind, perhaps a late season influenza or something like that. Given that most of the UK is between the Neptune and Chiron lines, public health may be very much in the public eye, and the time of an overhaul of some kind may be at hand. On a less favorable note, the Moon line goes through Dublin, Ireland (not to be confused with Dublin, Texas) and Lisbon, Portugal. 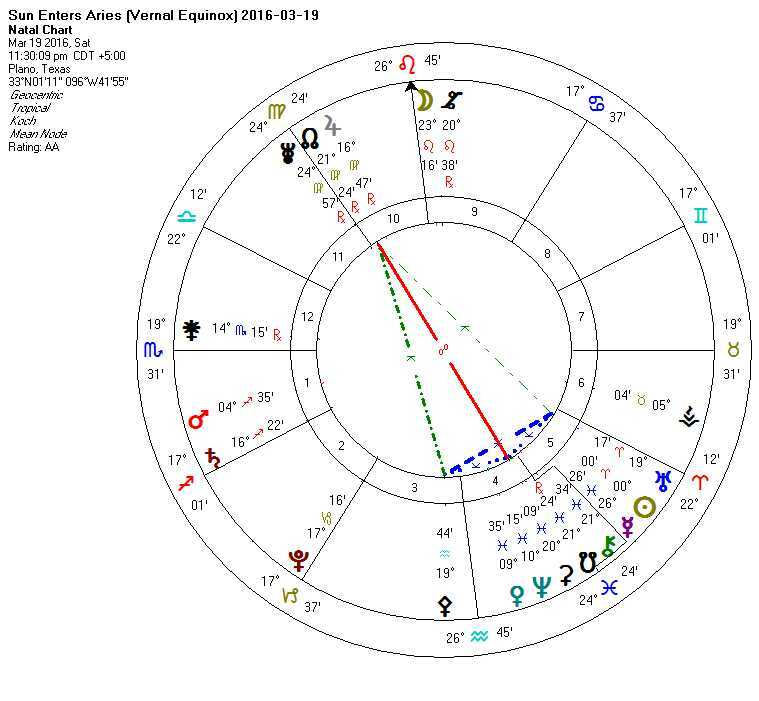 Since the Moon is in Pisces, and Pisces rules debt, this could be a bit unfavorable. However, the Moon is very old and shrinking fast, so maybe this is a chance for resolution of debt issues in these places. One way or the other, this Spring will be seen as a crucial turning point regarding these debt issues. The European map is complex, and only the most cursory analysis is offered here. Perhaps another astrologer can explore this map in more depth. (Jude, are you reading this?) As mentioned earlier, Moon in Pisces (debt) touches Dublin & Lisbon, and Neptune (debt) goes straight through Madrid. 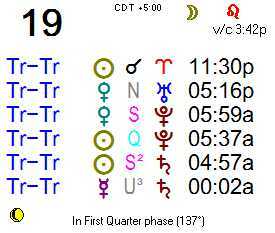 (Neptune, Pisces, and the 12th house are all equivalents, being planet, sign, and house representations of the same things.) My (sad and gloomy) interpretation is that the European debt problems will worsen this (astrological, VE to VE) year. 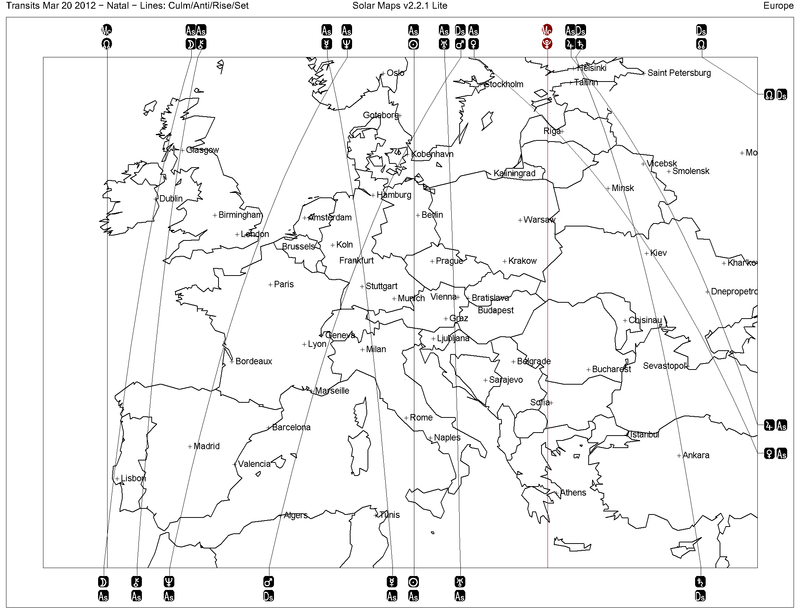 The Mars line goes through or near Kobenhaven, Hamburg, Frankfurt, Marseilles, and Algiers. Mars is the energy to act. In its high form, it is athletic achievements or at least the ability to get things done. In low form, and it has a propensity to take the low form, it is violence and war. Do not be surprised to see riots in any of these cities, possibly related to financial issues. Notably, Mars is in Virgo, which tends to ameliorate its effects. Since Virgo rules healthcare, the energy could be plowed into healthcare. And, Virgo (being opposite Pisces) also relates to debt. So, this confirms a possible response to the debt issue. The Pisces-Virgo axis is about the balance between work and play, so some may have a perception that others played while they worked (and paid). A node (karmic) line touches the southwestern tip of Ireland, and a karmic event could occur here (earthquake, explosion, accident, etc.) soon. Similarly, a Uranus Ascendant line touches Vienna, running roughly North-South, and could signal the same along that line. Kiev & Minsk are touched by a Venus line, which is very favorable, especially for financial relief and forms of art that resembling sculptures. Relief is to be expected along this line. But, a Pluto line runs through eastern Poland and other parts of eastern Europe, passing by Athens as it exits the continent. As mentioned earlier, Pluto in Capricorn has been associated with financial difficulties, so transformation in these areas will continue to occur. Africa is large and complex. Much of the analysis of Europe applies to the analogous lines in Africa. That said, expect to hear interesting news from Cape Town this Spring. Barbara Hand Clow has an interesting article with a different viewpoint on the Equinox. She presents a meditation (many people are searching for that) along with an analysis. 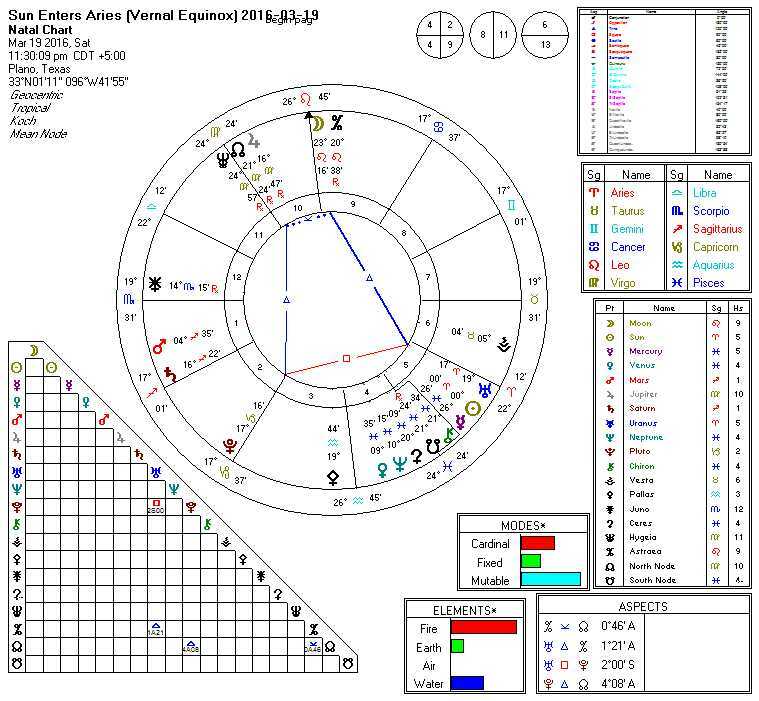 She focuses on the T-Square between Sun / Saturn / Pluto. With the Sun gone, and the Moon analyzed earlier, analysis of the T-Square should begin with Venus and Jupiter. Venus and Jupiter are exactly 16 degrees, each, from the 0 Aries point; they are equidistant. This midpoint is less that a degree from the 0 point, meaning (for most purposes) it is exact. It is also less that a degree from the opposition to Saturn (it is exact). Here is the chart, with midpoints. Sometimes astrology says what we already know, and it does so here: Venus (prosperity and harmony) will grow (Jupiter, the great amplifier) if we both (1) work for it and (2) eliminate the unnecessary (both of these are opposing Saturn). A great opportunity exists this year; this is the “brass ring” for some people. Pluto, square and completing the T-Square, says to achieve this we must undergo profound transformation. In some settings someone must die, but someone will be born. (Or “one door closes, and another opens.”) This is not necessarily a “natural person”; it could be a business, relationship, building, community, or maybe just a very entrenched habit that has outworn its usefulness. But, still, the answer is not quite found in any of these. Because of the “Triangle of Potential” (mentioned earlier), with Mars at 0 Leo, action and leadership will be necessary. Pluto indicates a possible change in leadership. 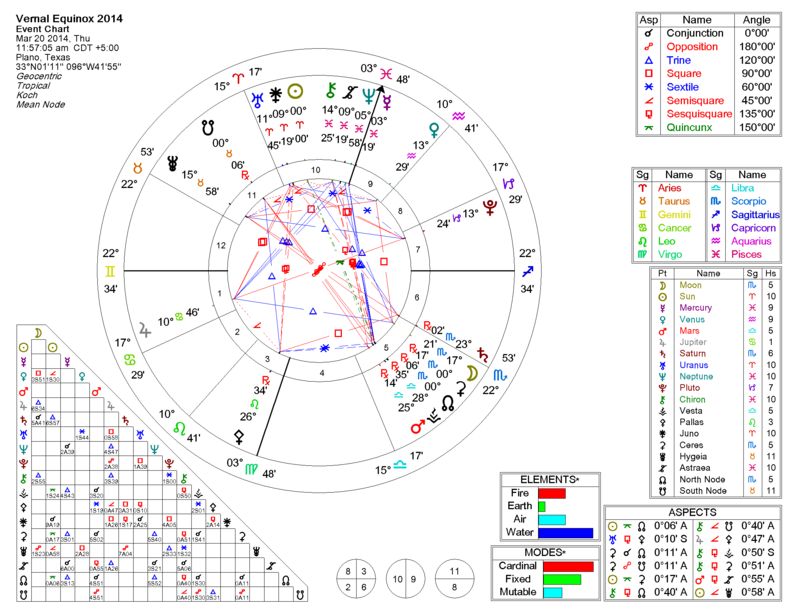 Pluto inconjunct (aka quincunx) Leo indicates a dissatisfaction with leadership. But, again, Mars is the key here: take action, if you want to grow (Jupiter) your prosperity (Venus) through the hard work and self-sacrifice (Saturn) and losses (Pluto) that are likely to come to pass. 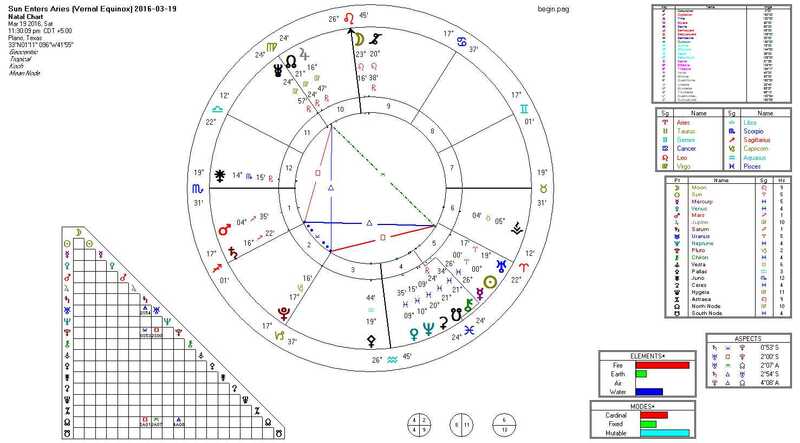 Mercury and Uranus form a midpoint that even more precisely addressed the T-Square (and the Triangle of Potential). Both govern communication (and Mercury governs transportation), with Mercury being more private and personal and Uranus being more public and global, so communications of all kinds will be at the center of achievement. In fact, the most important achievements this year may involve communications and how we communicate with each other, as personal and global communications become intertwined and blended. Perhaps this is a harbinger of 2012, and the changes yet to come. A Triangle of Potential is another fairly common pattern that comprises a trine, sextile and opposition, in other words two soft aspects and one hard aspect. In this case, the planet at the apex of the trine and sextile is the key to solving the opposition. The person will experience struggles, but by utilizing the energy of the trine and sextile will be able to make them work, so to speak. In many respects the hard aspects are what motivate us. If life was always easy we’d have a lot less incentive to grow. A Triangle of Potential will give a person just enough friction to utilize latent talents and abilities that otherwise might lie dormant. The planets and signs here give the potential to accomplish, and accomplish much. Both the Sun and Saturn are at the first degrees of their respective signs, and the Sun is at what many consider to be the most important point in the zodiac. The “solution” is found in Mars at 0 Leo (also an important point); Mars has just begun forward motion. That means old projects are being resurrected and given a second chance. Two paths exist here: the fierce anger of Mars in early Leo and the stubborn unyielding destructive power of Algol, or using the focus given by the Taurus Moon and the energy of forward Mars in early Leo to get something done. And, by “get something done,” I do not mean death or destruction. The potential here is to bring about lasting change (Saturn is very permanent, the “bones” of anything). So, as you celebrate this Equinox, think about the one major change you want to accomplish this year, and put all of your energy into accomplishing that. If you are a returning visitor, then you have probably read the “2010 Vernal Equinox: Bad Moon aRisin’” entry. 50% of you, or more, come here specifically to read that (which means that it sort of went “viral” on a very small scale, maybe 1,000 people or so). Traffic peaked yesterday, Thursday March 18th. Most celebrations are tonight. Except for some post hoc analysis later, this is the last entry regarding the 2010 Spring Equinox. We do not usually think of a “ghoul” as being the icon of the First Day of Spring. Of course, if your thing is casting spells, this might be an especially powerful time for you. I might add, the rest of this article is not about landscaping and gardening. However, if you do participate in rituals and celebrations, you might choose add an extra measure of care this year the Friday night before the Equinox, lest March be the cruelest month (instead of April). Algol is a bad dude, and Moon for the equinox is conjunct it. For beginners reading this, the Moon is supposed to be both our innermost self and the part of us that is nurtured and can nurture. The Moon is the most comfortable place in our home, and it is our final resting place (grave). Algol has alternatively been called the head of the demon, Satan, and the Medusa’s Head. The moniker of “Medusa’s Head” comes from Ancient Greece. The severed head of Medusa destroyed anything its gaze fell upon. The Moon conjunct Algol is like your mother, sister, daughter, or best female friend falling in love with the worst possible person imaginable. Your mom + Charles Manson doing LSD together and planning something really scary. Some people have had very bad experiences with Algol. The war in Iraq gets worse instead of better, with some of the worst / bloodiest / most tragic battles or events of the war. To be expected: typical news articles like this one from CNN, the Lindsay Lohan Muse Photoshoot Video (notice how it tends to be dark and distrubing), child star Amanda Bynes posing for Maxim in lingerie, and the NY Times Article “Drug Slayings in Mexico Rock U.S. Consulate.” These are probably the beginning of a long chain. And, as disturbing as this is, we might have another event similar to the Virginia Tech slayings. This is enoug h by itself; the rest of the equinox is for other articles. If you want, or need, a more detailed analysis, try this one.